Brouse blade knives sometimes feel like a Ferrari of knives. The style and feel and function are really at the top of their class. Everything is machined to very close tolerances and we are grateful to be able to offer these great products to you. These Mini Divisions are the smaller version of the popular Division. 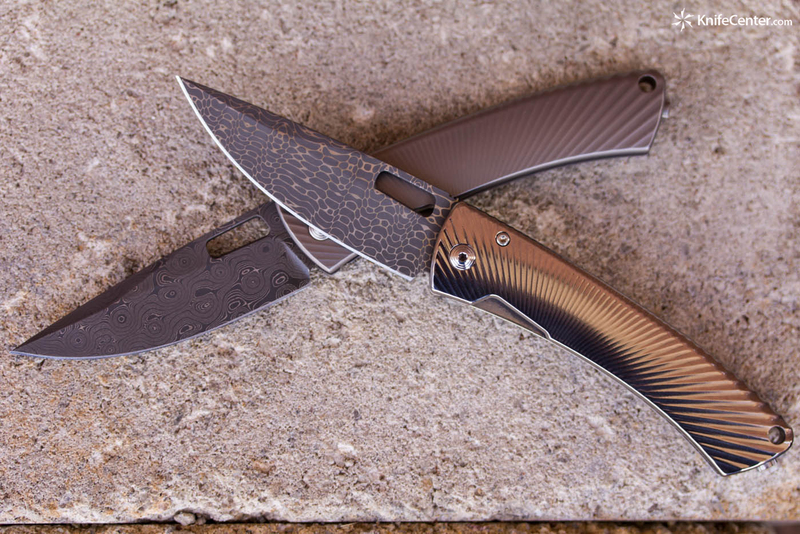 The Mini-Division Flipper offers a clean line design folder that bears a unique aesthetic, solid performance and innovative styling! The black cerakote finished D2 steel blade utilizes as an integrated flipper for quick blade deployment on a ball bearing pivot system. The drop point profile will feed material into the blade while a high hollow grind provides a very keen edge. 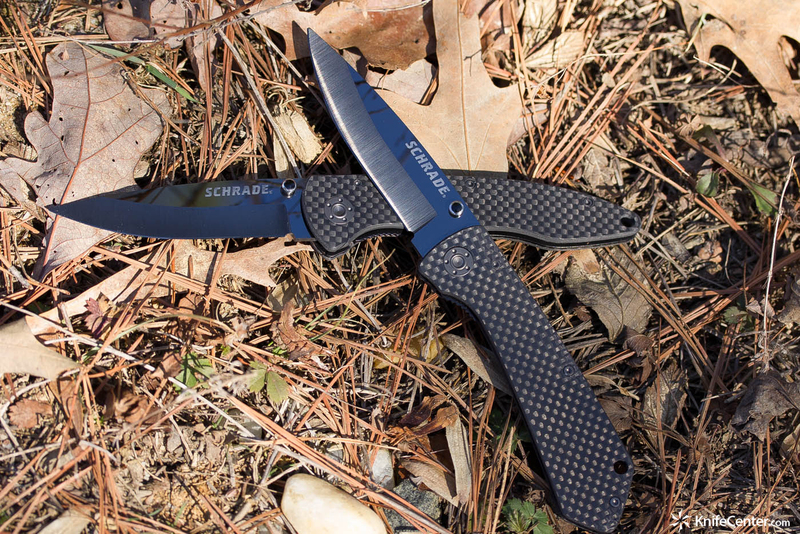 A slim profile allows for easy carry and gives the knife an extremely effective point. The 3D contoured G10 handles support safe ergonomics with aggressive jimping rounding out the stylish balance of form and function. Featuring a titanium liner lock system that is carbidized with tungsten carbide providing a hardened lock face surface that eliminates stickiness. Stainless steel standoffs and flow-through construction make for a light weight, durable and easy to care for large folder. With the added versatility of a reversible, deep carry, tip-up pocket clip, this will be the blade that you reach for when carry duty comes calling. Includes a signed and individually numbered certificate of authenticity. 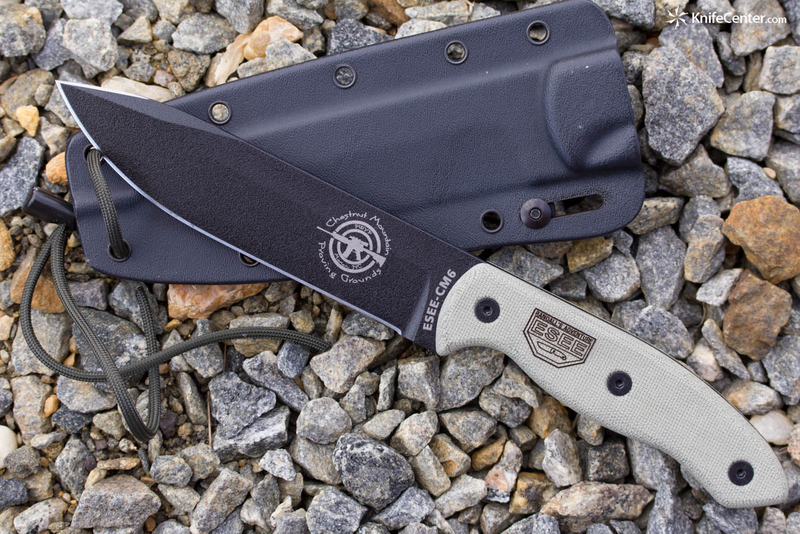 This is one of ESEE’s new tactical designed fixed blades and they are great workhorse fixed blade knives. You can’t buy a better knife for this price and we have them for sale at www.knifecenter.com. 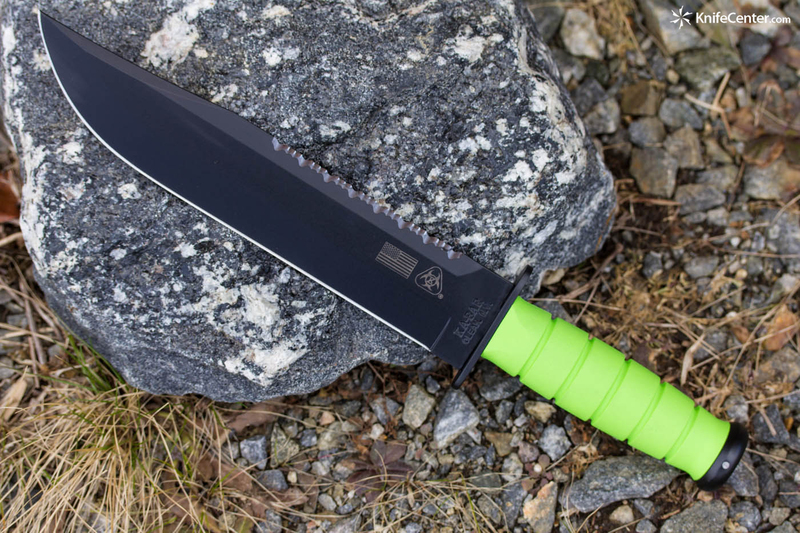 KA-BAR has a myriad of models of the original fighting knife and we like this new combat knife a lot. It has the Zombie” color and all, but at its heart, it is a very well made, all-around combat or camp knife. The materials are superb for really using in the field with 1095 carbon steel that will easily take a very sharp edge and handle material that should last a lifetime. These are worth checking out. See them at www.knifecenter.com. Sometimes it’s rewarding to get a special run of a great knife. 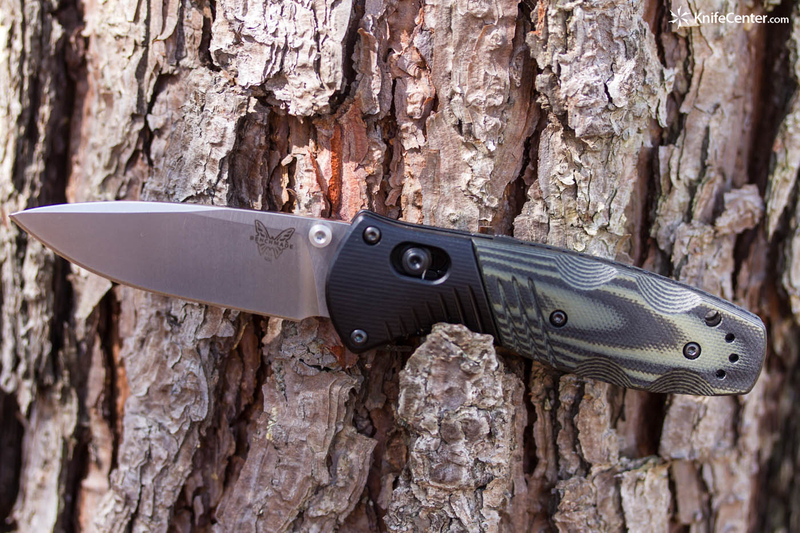 This Mini Barrage pocketknife is just that and is only available for a short time. This model has proved to be a great every day carry work knife and has great style and performance. 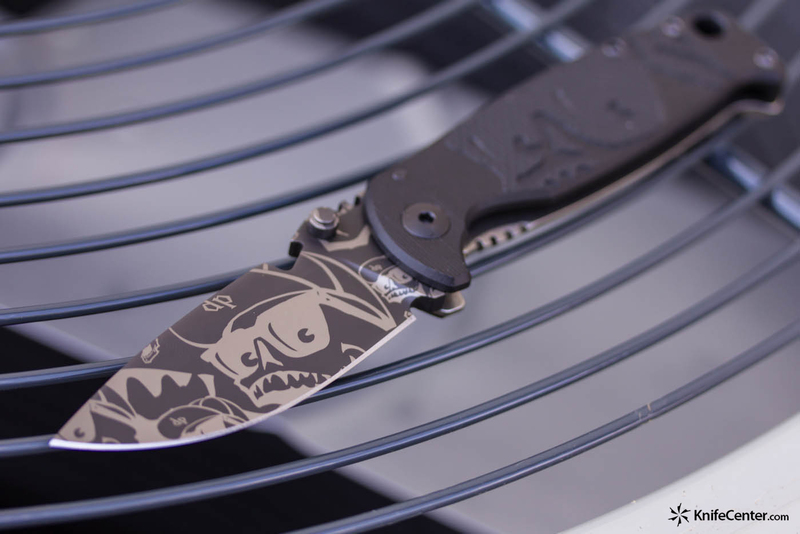 This limited edition has a really nice handle and the M390 steel that is very popular with custom makers and enthusiasts for its edge holding and corrosion resistance. Each one is numbered. It’s assisted and will give you years of use. Check it our at www.knifecenter.com. Now that these EX-FO3 knives from Hogue have arrived, I’m think really gonna miss the winter weather. No longer can I carry my knife hanging around my neck concealed inside my jacket – which is precisely where these blades belong. Created by one of our favorites Allen Elishewitz, this strongly built, extremely well made design is a super EDC fixed blade option. The cryogenically treated 154CM steel blades take an extremely fine edge and holds that edge for quite a while – from extensive experience with the EX01 folding model. 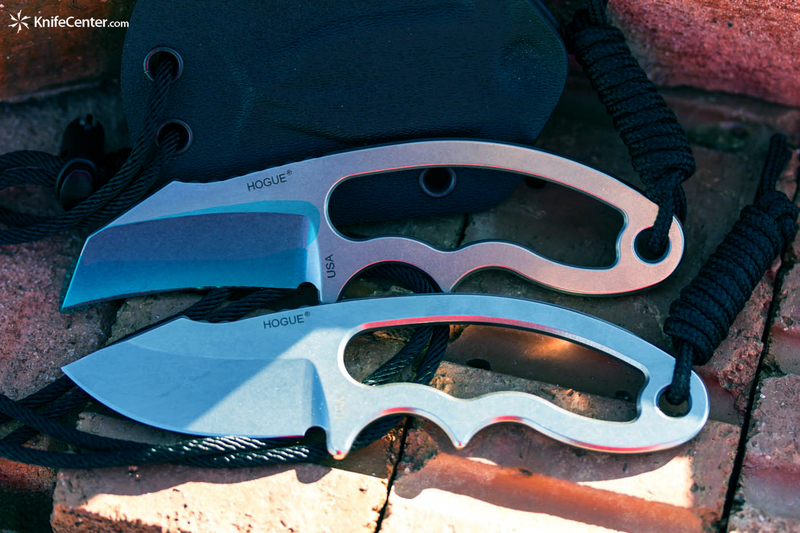 These neck knives are comfortable in the hand, as they should be from Hogue, and the thumb ramp is perfectly placed for your thumb to provide the most cutting power with minimal effort. The best thing about these new neck knives is that the sheaths are designed to hold the knife with the edge facing either way so it’s a cinch to resheath these miniature bad boys. Check ’em out at www.knifecenter.com. 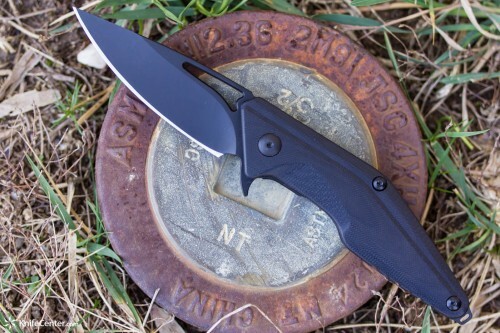 The Bladelight Camp is a very cool fixed blade by SOG. One might think that a “blade light” sounds kinda gimmicky, and it does, but the new SOG Bladelite actually “works”. I personally don’t think the blade itself (although it is adequate) is the best part of the overall offering. What makes the Bladelight is the sheath and the surprisingly powerful light. Although listed at ~ 37 Lumens, the light is emitted from 6 small bulbs making for a very powerful and focused beam. The light does not just work unsheathed, but with the sheath on as well – this is made possible by the six cutouts on the sheath and the Bladelight is equally bright with the sheath on or off. The sheath also features an indentation enabling the knife to make small wire/line cuts even when sheathed. Also there is a built-in sharpener on the sheath which is kinda handy. 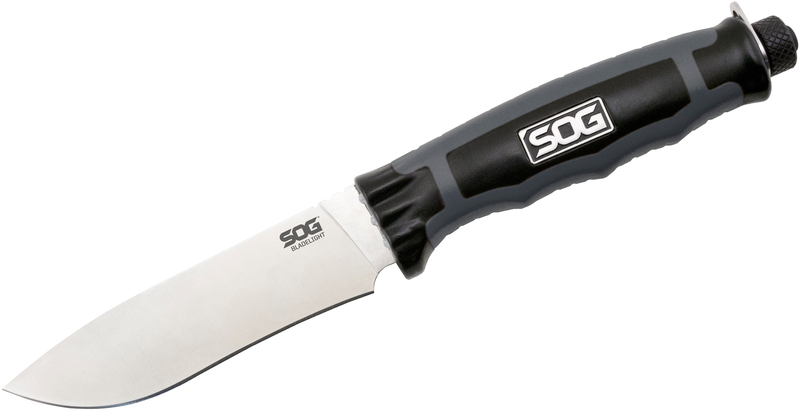 Now, more on the knife itself – it has a pretty good feel and the non-slip rubber handle makes it moderately grippy….and if you do drop it and it happens to break – it’s got a lifetime warranty so SOG will send ya a new one. The steel is 8Cr13MoV which is a good “value steel” with a decent balance of edge holding and corrosion resistance properties. 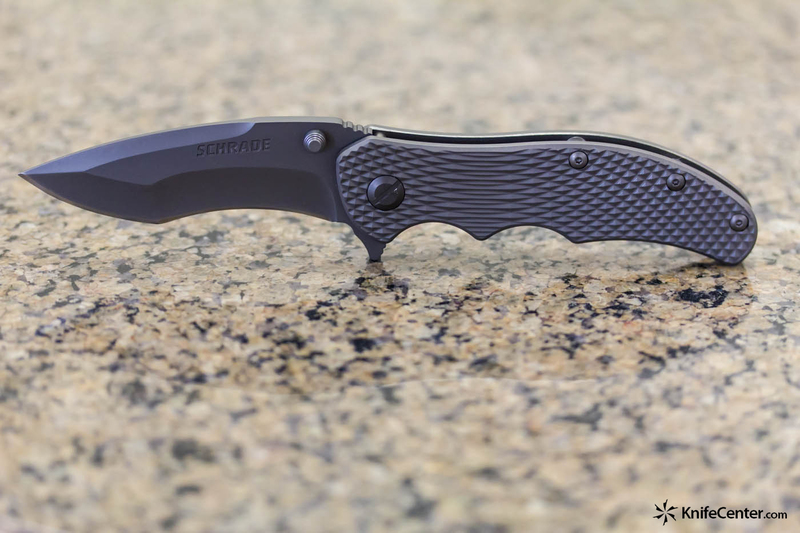 Here at KnifeCenter, you can get this one with the satin blade and white light or with a black blade and red LED – KnifeCenter also offers a fillet knife version.